The Women of St. James's meet on Tuesdays from October to May. All members of the parish and their guests are welcome to be a part of the Women of St. James's. 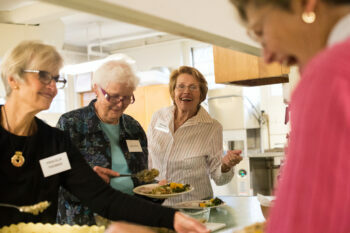 This is the only group of Episcopal women in Connecticut that has been meeting every Tuesday (Oct-May) for lunch for over one hundred years. We come together for fellowship and stimulating programs with outside speakers from the arts, government, community, religious and nonprofit groups, health, hobbies, and entertainment. We also offer worship before the meetings for those who can come earlier. Men are also welcome. The Women of St. James's sponsor and manage several parish-wide events including rummage sales to support parish and outreach programs. as well as myriad artists, scholars, photographers, museum administrators and curators, public leaders, and more.